I started to write articles on the wiki of Sec IT’s related to the posts on this blog. Here is the first one. If you want to modify or improve the article (I’m pretty sure there are plenty of typos and materials to describe), feel free to edit it on the wiki. Wireshark is cross-platform, it runs on various Unix-like operating systems including Linux, Mac OS X, BSD, and Solaris, and on Microsoft Windows. There is also a terminal-based (non-GUI) version called TShark. Wireshark, and the other programs distributed with it such as TShark, are free software, released under the terms of the GNU General Public License. The picture shows the output of ifconfig on a MacBook (Mac OS X v. 10.7.2). You can see that the wifi interface (en1) with its MAC address starting with the 3 bytes 00:25:00 has been assigned the IP address: 192.168.0.7. 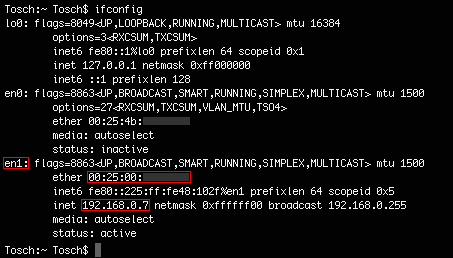 If you want to sniff the traffic from the network 192.168.0.0, you have to capture the packet from the interface ”en1”. A new window will open, listing all available interfaces for capturing packets. You can see on the screenshot below a list of four interfaces including the Ethernet (en0) and the wireless (en1) interface. The list gives the IP address assigned to the interface (in IPv6 on this picture, but you can toggle in IPv4 by clicking the IP address), the number of packets sent and received on the interface since the window has been opened and the number of packets per second in live. These last two details might also be used to determine which interface to use for sniffing regarding the amount of transmitted packets. There are two buttons per interface: “Start” and “Options”. “Start” will start capturing packets, while “Options” will open a new window for configuring the capture of packets. No. : Each packet has an identification number corresponding to the order in which it has been captured. Time: It is the time in second when the packet has been captured from the beginning of the capture. Source: The source address of the packet. Destination: The destination address of the packet. Protocol: The protocol used by the packet. Length: The packet length (in bytes). Info: It gives more information about the packet. To get further information, select a packet. In the frame below the list, you will see the packet structured in different layers (data link, network, transport, etc.). You can read the content of the headers of each protocol layer and the content of the payload by clicking on the arrow to scroll the information. ip.src: filter the IP source. Example: ip.src==192.168.0.7 will output only the packets with the IP source 192.168.0.7. ip.src==192.168.0.0/24 will output packets with the IP source from the network 192.168.0.0 with the mask 255.255.255.0.
ip.dst: same as ip.src but for the destination IP. tcp.port: filter the port. Example: tcp.port==80 will output only the packets sent on the port TCP 80.
udp.port: same as tcp.port but for the protocol UDP. A good tutorial for Wireshark by Chris Sanders.